Big Blue Nation reaches far past Lexington’s city limits. Across the globe, faculty and students of the College of Arts & Sciences are always seeking out new endeavors and fortifying existing relationships overseas. Alan Fryar in the Department of Earth and Environmental Sciences (EES) was awarded the prestigious Fulbright Program scholarship by the U.S. Department of State’s Bureau of Educational and Cultural Affairs. Through its support of education and research, this program promotes collaboration between the U.S. and other countries to address common priorities and concerns. For his project, Fryar is working with professor Lahcen Benaabidate (Faculté des Sciences et Techniques – Fès) to study the influence of climate change on spring flows in Morocco’s Middle Atlas Mountains. Morocco has been in drought since the 1980s, and global climate change is expected to reduce available water resources further. The Middle Atlas plateau is the “water tower” for Morocco’s two largest rivers, the Sebou and the Oum Er Rbia, which originate from springs. These rivers are a major economic resource for the country, so an understanding of the impact of climate change on their source is imperative to long-term water management strategies. “Many countries, including the USA, face challenges in supplying sufficient water for human needs while limiting environmental degradation,” said Fryar. Since March, Fryar and Benaabidate have been measuring water level, temperature, and water chemistry at three large springs, which are used as water supplies for local communities. Initial results of monitoring indicate that the springs do not respond dramatically to snowmelt or rainfall. These observations suggest that the effects of climate change, such as reduced precipitation and increased temperature, on the flow of the springs may be gradual. Fryar’s experiences have not been limited to his research. While abroad, Fryar has attended an international conference on use of satellite technology for water resources management. In addition to acquiring new knowledge, Fryar has also been advancing UK Education Abroad by visiting two study abroad sites at universities in Morocco. Whether he’s abroad or at UK, Fryar explains that students are crucial contributors to the advancement of his research. Geography professor Stan Brunn defines China by its fluidity – where no place or time is the same during a week. In a country with centuries’ worth of history combined with recent decades of postmodernism, the past and present are sometimes in sharp contrast side by side. “The dynamism in the countryside, in cities, even in shopping malls is inescapable,” he said. Brunn is in Kunming, China, helping faculty and graduate students at Yunnan Normal University accomplish their goals. He is determined to assist faculty and graduate students publish in major international scholarly journals, teach graduate classes, and participate in various research projects. 6,657 miles away in Cape Town, South Africa, Steven Yates has been maintaining a collaborative relationship with the University of the Western Cape. He will return again to participate in the fourth “Tastes of Nuclear Physics” workshop this fall. Yates, who holds joint professorships in both the Department of Chemistry and the Department of Physics and Astronomy, explains that the workshop is a place where world-class speakers give lectures to a group of 30 to 40 students. Nontobeko Khumalo was one of the student attendees of those workshops. She graduated from the University of Zululand with a master’s degree in physics and is pursuing a Ph.D. at the University of the Western Cape, and is currently at UK doing research in the university’s renowned facilities. “For a ‘young girl’ from a small village (Nongoma) in South Africa, this is a great opportunity. It was a long trip getting here, but it was all worth it. I was welcomed by beautiful weather and everyone I’ve met has been nice. So, I would say Kentucky is blessed with the nicest people in the world,” Khumalo said. 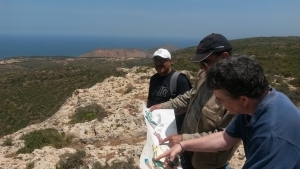 --Alan Fryar with faculty colleagues from Universite d'Oran (Algeria) on a field trip to examine geology along the Mediterranean coast. 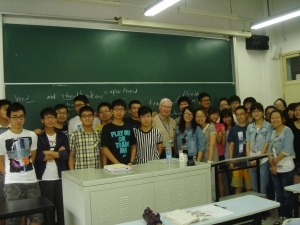 --Stan Brunn and a contingent of students during his trip to China in the summer of 2014. --Steven Yates poses with students participating in the "Taste of Nuclear Physics" workshop.